Richard Dawkins made himelf famous decades ago with The Selfish Gene (1976) and famous all over over again with The God Delusion (2006), a merciless attack on religion in general and Christianity in particular. Between those two he wrote a string of popular science books, mostly about evolution but including Unweaving the Rainbow (1998) which was a reply to those who said his hard-line scientific approach took all the pleasure and poetry out of life. He argued in that book that there was as much pleasure and as much magic in science as in art or mythology, with the significant bonus that science was really true. The outer chapters bracket Dawkins’ examination of the standard Big Questions – the origins of animal life (including ourselves) and the universe – and the causes of such natural phenomena as rainbows and earthquakes. 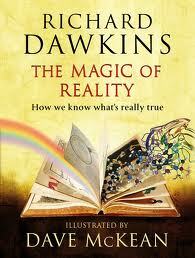 Each of them begins with myths ‘explaining’ the answers, which the author counters with the scientific answer. The myths come from people all around the world – Maori, Japanese, African, American Indians, Jews … yes, Judaism and Christianity are in there on an equal footing. The science, in reply, is genuine but lucid and nontechnical. His next-to-last chapter, structured the same way, is ‘Why do bad things happen?’ and he discusses demons, angels and original sin before explaining chance and evolutionary necessity: ‘bad things’ happen because ‘things’ happen, and life is a constant struggle for survival which some of us, inevitably, lose. That leads naturally into his discussion of miracles. He argues, of course, that the universe doesn’t care about fairness or mercy and that miracles don’t exist, saying that anything that looks like a miracle is a natural event which we can’t yet explain but should work on understanding, or something that didn’t really happen in the way people thought, i.e. the observers were mistaken, or reports were exaggerated. Summarised as quickly as this, The Magic of Reality is transparently an attack on religion and celebration of science – on this side, science; on that side, superstition; which side are you on? That is, indeed, what the book does but the young reader is unlikely to be fully conscious of it because my summary doesn’t accurately reflect the space given to the issues in the book. In reality, those first and last chapters add up to barely 40 pages with 220 between them. In its favour, the writing is lively and direct, the information is accurate and brilliantly presented and the illustrations are colourfully inventive. But The Magic of Reality left me slightly uneasy. Why? Because of a gap which Dawkins doesn’t acknowledge and (for all I know) may not even be aware of: art, mystery, magic and religion do have functions which do not conflict with the functions or discoveries of science and yet cannot be addressed by science. If we teach our children to throw them out, we impoverish our civilisation. Morality and ethics? Science says nothing, but hints that Darwinian survivalism is the only rational rule. Art? Science says nothing but seems to suspect that it is a delusion or a mating ritual. And so on. Science is so strictly focused on objective observational evidence that it is deliberately blind to anything that happens behind the eyes and between the ears of every one of us. Love and hate, generosity and compassion, ambition and lust, joy and despair – science doesn’t want to know about them. But they are intrinsic to our make-up and if we don’t somehow learn about them we have no way of understanding them. I find myself applauding the book for its many good points but hoping that readers balance their diet. The Magic of Reality is food for the growing brain, but we do need food for the heart and (dare I say it) the spirit as well.